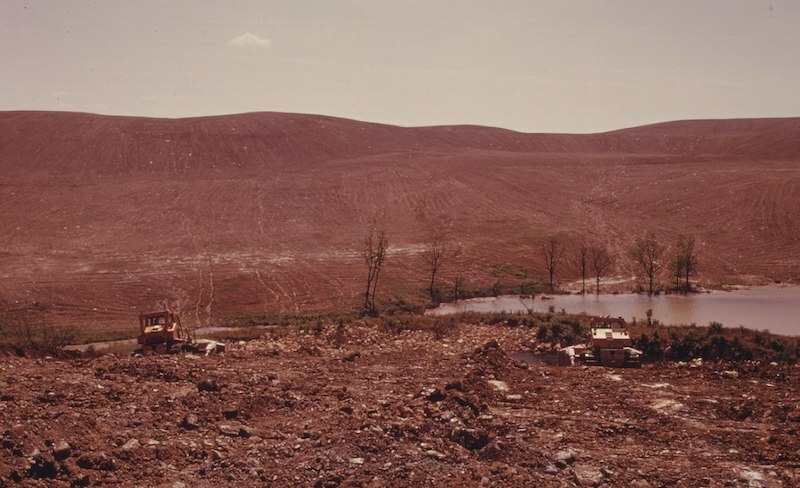 Strip mined land being recontoured by coal companies, Morristown, Ohio, 1974. Photo: Erik Calonius. via Wikimedia Commons. Excerpted from The Progress of This Storm: Nature and Society in a Warming World — on sale for 50% off through March 18 as part of our Politics of Climate Change reading list. Distilled through Foster’s pioneering exegesis, the theory makes inventive use of Marx’s comments in the third volume of Capital on how capitalist property relations "provoke an irreparable rift in the interdependent process of social metabolism, a metabolism prescribed by the natural laws of life itself"; operationalised in a variety of ways, it has elucidated everything from the imbalances in the global nitrogen cycle to climate change. 1 It is a method for tracking disruptive combinations of the natural and the social. In a recent tour de force of metabolic rift analysis, The Tragedy of the Commodity: Oceans, Fisheries, and Aquaculture, Stefano B. Longo, Rebecca Clausen, and Brett Clark start from the self-evident yet so often lost premise that "ecological concerns are not problems derived internally, originating from ecosystems themselves, but are produced externally, by social drivers. For example, the oceans are not polluting themselves; humans are doing it." That tragedy is possible, however, only because "human society exists within the earthly metabolism." 2 In the case of fishing — a primordial form of Stoffwechsel — a dramatic shift occurred in the middle of the nineteenth century, when companies armed with steamboats could catch hauls at new orders of magnitude; since then, but particularly since the post-war period, global fish stocks have come under lethal pressure. Rifts in the reproductive cycles of fish have opened up everywhere, from the bluefin tuna of the Mediterranean to the salmon of the Pacific Northwest — a result of how the elements of company and commodity mix with water. If this sounds like a theory and a method that abide by all the precepts suggested above, it is because any twenty-first-century ecological Marxism necessarily stands on their shoulders. the two "fit together." 4 But exactly the same critique can of course be levelled against that choice of words. For two pieces to fit together, they must first be two different pieces. Moore himself seems forced to employ the foul conjunction in phrases such as "human and extra-human nature," "the soil and the worker," perhaps because a language of permanent in-hyphenation would be unreadable. 5 It certainly would not solve any real conceptual problems. Why all this phraseology? It seems, at a closer look, that Moore has fundamentally misunderstood the requirements for transcending the Cartesian legacy. In a sentence of the kind repeated ad nauseam in Capitalism, he declares: "In place of a Cartesian optic — the 'exploitation of labor and nature' [words from Foster et al.] — I would begin with two forms of labor-in-nature." 6 But there is nothing Cartesian about saying "labour and nature." Foster et al. would be Cartesian if they thought that labour and nature consisted of different substances or inhabited separate spheres, so that the one could be analysed without reference to the other — a very common perception in the history of capitalist modernity but precisely the opposite of what the metabolic rift school teaches. As Foster himself retorts, "there is no contradiction in seeing society as both separate from and irreducible to the Earth system as a whole, and simultaneously as a fundamental part of it. To call that approach 'dualist'" — in the Cartesian sense — "is comparable to denying that your heart is both an integral part of your body and a distinct organ with unique features and functions." 7 What Moore does here is simply to succumb to the temptation of substance and property monism. Beneath the arid semantic quibble, then, there is substantial disagreement on whether nature and society should at all be distinguished from one another. It is here that one finds the core of Moore’s theoretical project: an unbridled hybridism in Marxist garb. He has taken on the task of importing "the philosophical victory" of such thinkers as Neil Smith and Bruno Latour into the theory of capitalist development, setting out from a postulate that should by now be familiar: "The old language — Nature/Society — has become obsolete. Reality has overwhelmed the binary’s capacity to help us track the real changes unfolding, accelerating, amplifying before our eyes." 8 The aim of "world-ecology" is to act as a solvent on all related distinctions. "Put in these terms, the apparent solidity of town and country, bourgeois and proletarian, and above all Society and Nature, begins to melt." 9 Moore has found a way to abolish even the opposition between the classes — in language. Several versions of hybridism are here banded together: much influenced by the production of nature theory, Moore opposes references to "a nature that operates independently of humanity," and to external limits, and to biophysical flows as having "ontological priority" over social relations, leading him right back into the blind alley: "We can dispense with the notion that something like climate change can be analyzed in its quasi-independent social and natural dimensions." If so, we can dispense with the notion of analysing it at all. Skidding in the other direction, Moore adopts the terminology of the material turn, defines agency as a "relational property of specific bundles of human and extra-human nature," dresses up water and oil as "real historical actors," attributes agency to climate as such, says that capitalism is "'co-produced by manifold species" and, logically, contends that coal formations were "subjects of historical change" in England. They were not, of course, in any meaningful sense of the word, subjects in what happened in England or anywhere else, and the picture does not become a speck clearer by labelling coal an "actant" possessing "agency." The singular achievement of Moore turns out to be a double collapse, such as in the following précis of his view: "Capitalism makes nature. Nature makes capitalism." 10 Neither of those propositions is true. Capitalism emphatically does not make nature; nature most definitely does not make capitalism. It is the utter disharmony between the two that needs to be accounted for, and it is that which the theory of the metabolic rift has so consistently foregrounded. The double collapse partly flows from a view of dialectics as a method not so much for articulating antagonism as for achieving holism. It would be edifying here to keep in mind the admonition of Levins and Lewontin: "There is a one-sidedness in the holism that stresses the connectedness of the world but ignores the relative autonomy of parts." 11 Among the effects of that one-sidedness is that the parts disappear from view. Moore casts doubt on the belief "that such a thing as 'society' exists" and suggests that "entropy is reversible and cyclical," when entropy is defined by the second law of thermodynamics precisely as never being that. 12 With no laws of society and no laws of nature — what is there left to study? On the other hand, there are, symptomatically, passages where Moore seems to accept the need for a binary of the social and the natural. When it comes down to saying something concrete about what capitalism actually does to (or in) the web of life, the explanatory model of historical materialism slips through cracks in the jargon. Now Moore argues that certain societies in the long sixteenth century developed the law of value as a new set of relations between people, which induced a complete shift in how these people related to non-human nature: for the first time in human history, "the law gives priority to labor productivity, and mobilizes uncapitalized natures without regard for their reproduction." Further, "a civilization premised on money and labor-time called forth a very different kind of time," based on which capital sought to remake material reality "in its own image, and according to its own rhythms": again, an impulse at changing nature emanating from property relations. Moore is then able to identify a clash "between the finite character of the biosphere and the infinite character of capital’s demands." Or: "Nature is finite. Capital is premised on the infinite" — hence ecological crisis. 13 And there we have the whole package again: a duality, a separation and conjunction, an attribution of inherent and antithetical properties, an intelligible argument about why capital must go berserk in nature. Hybridism resists any juxtaposition between relations and laws of motion internal to capitalist society, on the one hand, and relations and laws of motion internal to nature on the other. But when Marxists write about the environment, they are pulled to the magnetic opposition between those poles. Take for instance the greatest classic of Marxist ecological feminism, The Death of Nature: Women, Ecology and the Scientific Revolution (which, contrary to appearances, contains no end-of-nature thesis). In this groundbreaking study from 1980, Carolyn Merchant traces the historical shift from a conception of nature as a mother to be revered and respected, an organic living being, sometimes benevolent and sometimes wrathful, to one of nature as a dead, inert object to be manipulated and controlled with maximum efficiency. The shift pivoted on a transition in social property relations in Europe, England in particular: starting in the fourteenth century, the English ruling class moved towards capitalist arrangements in agriculture, drained the fens, enclosed the fields, cut down the forests, removed the taboos on mining and pitted the peasant as worker against the landlord as capitalist. 14 Some priceless things were broken in the process. Or, to take but one other example: in an excellent, long overdue Marxist intervention into the debate over the biodiversity crisis, Extinction: A Radical History, Ashley Dawson observes that "capital must expand at an ever-increasing rate or go into crisis." As it does so, "it commodifies more and more of the planet, stripping the world of its diversity and fecundity," puncturing holes in the web of life with incalculable consequences: "biologists are only just beginning to understand the cascading, ecosystem-wide impact of the destruction of the megafauna." 16 One emergent property comes into conflict with a whole planet of other emergent properties. This is the necessary and fundamental form of a Marxist account of ecological crisis, which does not exclude other drivers but centres on a feature unique for capitalist relations: the compulsion for perpetually expanding absorption of biophysical resources. Such a property cannot be found in nature. Any creature that had it would be fantastically maladaptive and quickly go extinct; capital has been able to maintain it into the twenty-first century only by establishing complete dominion over tellurian nature. But it cannot go on forever. The ongoing sixth mass extinction looks particularly amenable to the sort of analysis outlined here. Thus we have strong evidence that the long postponement of the crackdown on the bustling London ivory market promised by the Tories has provided continuous incentive to criminal syndicates to slaughter African elephants and smuggle their tusks into Britain, but we have no signs of the elephants jumping off cliffs or otherwise committing mass suicide. 17 The biodiversity being torn apart is neither a human creation nor a source of agency in this disaster. On that environmental issue as well as on any other, it is possible to say something of ecological Marxist import only by practising property dualism. 1. Karl Marx, Capital: Volume III (London: Penguin, 1991), 949. The two key works in which the theory is formulated and applied are Foster, Marx’s Ecology; John Bellamy Foster, Brett Clark and Richard York, The Ecological Rift: Capitalism’s War on the Earth (New York: Monthly Review Press, 2010). Some of the most noteworthy articles on climate change and fossil energy emerging from the metabolic rift school are Brett Clark and Richard York, "Carbon Metabolism: Global Capitalism, Climate Change, and the Biospheric Rift," Theory and Society 34 (2005): 391–428; Richard York, "Do Alternative Energy Sources Displace Fossil Fuels?," Nature Climate Change 2 (2012): 441–3; Richard York, "Asymmetric Effects of Economic Growth and Decline on CO2 Emissions," Nature Climate Change 2 (2012): 762–4; Brett Clark, Andrew K. Jorgenson, Daniel Auerbach, "Up in Smoke: The Human Ecology and Political Economy of Coal Consumption," Organization and Environment 25 (2012): 452–69; Kelly Austin and Brett Clark, "Tearing Down Mountains: Using Spatial and Metabolic Analysis to Investigate the Socio-Ecological Contradictions of Coal Extraction in Appalachia," Critical Sociology 38 (2012): 437–57. 2. Stefano B. Longo, Rebecca Clausen and Brett Clark, The Tragedy of the Commodity: Oceans, Fisheries, and Aquaculture (New Brunswick: Rutgers University Press, 2015), x, 23. Emphasis added. 3. See particularly Jason W. Moore, "Transcending the Metabolic Rift: A Theory of Crisis in the Capitalist World-Ecology," The Journal of Peasant Studies 38 (2011): 1–46; "Toward a Singular Metabolism: Epistemic Rifts and Environment-Making in the Capitalist World-Ecology," New Geographies 6 (2014): 10–19; Capitalism in the Web of Life (London: Verso, 2015). The most systematic picking apart of Moore so far is Kamran Nayeri, "'Capitalism in the Web of Life' – A Critique," Climate and Capitalism, climateandcapitalism.com, 19 July 2016. 4. Moore, Capitalism, 47. Emphasis in original. 5. Ibid., e.g. 228, 291, 293. 7. John Bellamy Foster and Ian Angus, "In Defense of Ecological Marxism: John Bellamy Foster Responds to a Critic," Climate and Capitalism, climateandcapitalism.com, 6 June 2016. See further John Bellamy Foster, "Marxism in the Anthropocene: Dialectical Rifts on the Left," International Critical Thought 6 (2016): 393–421. 8. Moore, "Toward," 14; Moore, Capitalism, 5. White et al. share Moore’s ambition of developing a hybridist eco-Marxism and present a very similar critique of Foster et al. See White et al., Environments, e.g. 104, 152. 10. Moore, Capitalism, 6, 180, 85, 36–8, 4, 179, 196, 8. Emphases in original. 11. Richard Lewontin and Richard Levins, Biology under the Influence: Dialectical Essays on Ecology, Agriculture and Health (New York: Monthly Review Press, 2007), 107. 12. Moore, ‘Transcending’, 8; Moore, Capitalism, 97 (cf. 84). 13. Moore, Capitalism, 60, 234–5, 112, 87. 14. Carolyn Merchant, The Death of Nature: Women, Ecology and the Scientific Revolution (San Francisco: HarperCollins, 1980), 43–68. Her superb account owes much to Robert Brenner. 15. Ibid., 43, 51, 295. Emphasis added. 16. Ashley Dawson, Extinction: A Radical History (New York: O/R Books, 2016), 12–13, 16, 24. See further e.g. 42–3, 53. 17. Jamie Doward, "Tories’ Failure to Halt Ivory Trade 'Risks Extinction of Elephants'," Guardian, 27 August 2016.